So you’ve picked up a brand new Galaxy Tab S3 or any other Android tablet and your first thought is: how am I going to make the most of this extra screen space? 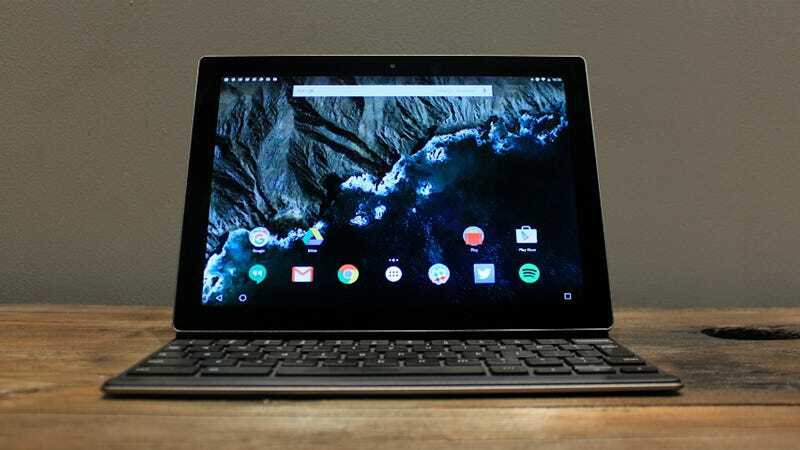 The general consensus is that iOS is stronger in the tablet department, but there are Android apps out there that work particularly well on a bigger screen held horizontally. There are just very few apps. Don’t expect to find a nice Tweetbot equivalent for Twitter on a tablet. Nor should you anticipate all your traditional apps have a tablet layout. Android apps are still built primarily for use in portrait mode. Yet beyond video players like Netflix or Plex, or games that have been scaled up, like GTA or Super Mario Run, there are still a few solid apps that have tailored tablet experiences. Here are 8 of our favorites. The world’s most well-known music streaming service makes a decent go of updating its Android UI for tablet devices, stretching track listings and album art to make the display seem as full as possible. It’s not perfect but it’s getting better, and there are some nice touches like the split view for browsing playlists. We’re partly including Spotify because of all the devices you can hook the app up to, including Sonos speakers—so there’s the option of setting up your tablet somewhere in the house and using it as a master controller for your music. Google Play Music looks good on tablets too, but Spotify has a slight music selection edge. Spreadsheets are perfectly suited to tablets and we think Microsoft’s app makes slightly better use of a bigger screen than Google’s own effort (in fact all of the Microsoft Office Android apps are worth a look). You get the basics for free on screens below 10.1 inches and a few extra goodies with an active Office 356 sub. As for the app itself, it’s more powerful than you might expect for a mobile app, with support for annotations, basic chart types, column sorting and filtering, plus all the basics of formulas and cell formatting too. The ribbon interface adapts neatly to suit mobile devices and if you’ve got a keyboard attached it’s almost like you’re on a laptop. What else can you use that extra screen space for? Filter previews and toolbars, that’s what, and Adobe Photoshop Express is only too happy to help out. It’s nowhere near the desktop application in terms of features and power, obviously, but it’s one of the best Android image editors for using on a bigger display. You can drop in preset filters or make manual tweaks to colors, contrast and brightness, you can correct issues like red-eye, erase unsightly photobombers, crop and straighten pictures, and much more besides. With a larger screen there’s plenty of room to see both your image in detail and the full set of tools and filters that are available. Of course Google’s own Gmail makes good use of a tablet format, splitting itself into two columns so you can actually keep your inbox and the currently selected conversation both in view at the same time. You can even go for a three-column view and get a look at all your labels and categories too. Plus you get all the usual Gmail goodness, including multiple account support that’s much easier and more seamless than it is on the web, and different ways to customize alerts so you only get them for messages that matter. Bonus entry: Google Maps is another Google app that works well on Android tablets. We could add any kind of e-reader or read-it-later app here, but Pocket genuinely makes decent use of the extra screen real estate on an Android tablet, with its tiled layout, fly-in menus and wide images and videos. It’s now owned by Mozilla, so we’ll have to see how that affects development in the future. For the time being Pocket is a very useful article archive app for your tablet, and one of the areas where tablets are worth their price is when you want to kick back on the sofa and catch up with your reading. You can cache stories for offline reading too, which may come in handy on devices without data plans. It’s fair to say Evernote has lost a bit of momentum in recent years, but judge it on its Android tablet app alone and it’s still just about the best note-taking tool out there. In part that’s due to the flexibility Evernote has always had—you can make your notebooks pretty much whatever you want them to be. The app actually works well in both landscape mode (for organizing notes) and portrait mode (for reading through single articles) and the app’s various toolbars and menus take up intelligent positions on screen. As you dig deeper into your notebooks, the layout shifts to match whatever it is you’re trying to do. Hats off to the developers of the IMDB’s tablet app, because it’s several orders better, in layout terms, than the equivalent phone app or even the original website. There’s always been a ton of information available on the Internet Movie Database—from who starred in what to movie times—and the tablet app makes getting at it all very simple and intuitive. Pull up a movie page, for example, and you get a big look at the trailer with film details and the cast list down the side. As far as TV shows go, you can keep tabs on both individual episodes and the series as a whole thanks to the tablet layout, and browsing through searches looks fantastic with large, colorful thumbnails. Flipboard was made for tablets and its Android app is a joy to use, with big images, intelligent layouts, and lots of customization options. As we mentioned in the description for Pocket, you’re probably going to want to lean back and do some reading on your tablet, so you may as well do it in style. If you’ve never used Flipboard before, the on-boarding process is nothing to be scared of—you’ll be asked to specify a few interests or favorite publications to get started, and you’re then presented with a choice of current articles. You can easily tweak and personalize your Flipboard feed at any time too. Do Android users dream of electric sheep?